NRITYA is an expression of Deborah Dawson’s Indian background and how that influences the way she moves through the flamenco art form. Friendly and communicative, Carmelita has plenty of charm and magnetism. A sociable extrovert, she is pleasant, cheerful and very likeable. She was born to express herself, interact with others and have a good time. 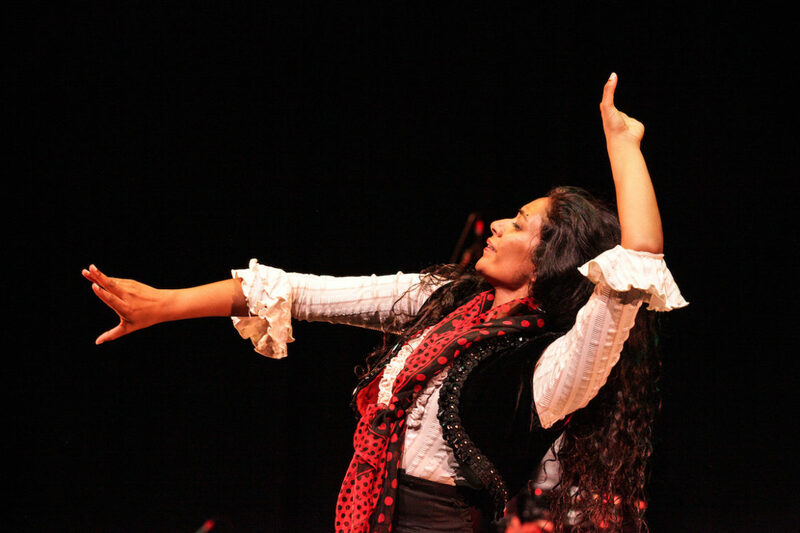 Meet Deborah Dawson, flamenco dancer and the true essence of “La Carmelita”. In La Carmelita’s new production, NRITYA, this bailaora is on a mission to understand the flamenco dance diaspora by retracing her cultural and instinctual passion for the dance genre. Deborah’s story, although it may seem to have started in Vancouver Canada, actually started a long time before her birth, over 2000 years ago in fact. According to the Natya shastra, a Sanskrit text on the performing arts written over 2000 years ago, the goals of theatre are to empower aesthetic experience and deliver emotional rasa. A rasa literally means the essence of the dance, the untold but deeply felt emotional story the dancer is telling with their body. In a nritya, the storyteller articulates a legend or a spiritual message where the dancer tells their personal story as they traverse the gamut of their life through innocence, pain, joy, and back again. A true storyteller makes the audience connect to their own deeply personal stories. NRITYA, the production, is an expression of Deborah’s Indian background and how that influences the way she moves through the flamenco art form. In order to better understand her sheer passion for flamenco, Deborah has been exploring, on a much more intellectual level, her relationship with the dance. Deborah is a Canadian born flamenco dancer, her parents, of South Indian descent are Malaysians. Deborah grew up knowing of her cultural background but never pursued the art form of Indian dance. Her affair with flamenco started in Vancouver which eventually propelled her to Europe to study the dance even further. After dancing for a few years in Europe she realized the root of flamenco is buried deep in the history of India. Deborah – born with an intrinsic knowledge where her body knew the golpe and balanceo y vaivén (stomps and sways) of flamenco long before her mind connected the historical connection – always knew flamenco was her destiny, but had not known it was a part of her history. This production is not a fusion of flamenco and Indian, instead it is a personal storytelling of the dancer as she uses the elements of Indian and flamenco’s music and dance to portray her pain, love, joy, and triumphs. Deborah La Carmelita’s repertoire in NRITYA tells the story of her life through dance…her saviour and her inspiration.